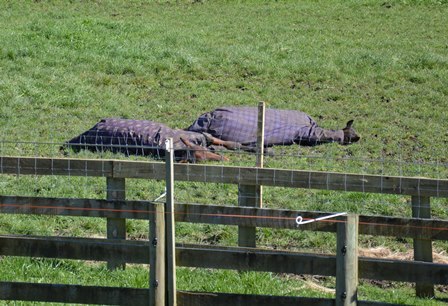 It’s a beautiful cool, sunny Spring morning and “the boys” aka Thephantomtollbooth (Real Desire-Zenterfold) and Isputtingonmytophat (Pegasus Spur-Sun Isa) are sprawled out in the paddock loving the fine weather and warmth of the sun, looking like two logs! They are great mates. Both are heading to the yearling sales at Karaka in February. “The boys” having a hoon around the paddock. Another weanling purchase from Alabar is Elect To Go (Gotta Go Cullect-Innsbruck), now a 3yo filly that Kym and I co-own. She has qualified and is having a spell, hanging out with Kym’s third weanling purchase, Souvenir Glory, now 4yo, who had a few races last season and is a competitive little Elsu mare. Like many of the Gotta Go Cullects I have seen, Elect To Go is not a big type – neither was Gotta Go Cullect. They seem slighter, speedy types. This filly is a very willing horse, doing everything right, and should strengthen up for her next time in. But back to the breeding side of things, which is Isa Lodge’s main focus. I’ve booked Zenterfold to Rock N Roll Heaven. She will be foaling this year (McArdle) at Patumahoe for co-owners Geoff and Aria Small. She’s our “shuttle mare”, moving year by year between Cambridge and south Auckland and taking it all in stride. I’ve booked The Blue Lotus (daughter of Zenterfold) to Shadow Play and will be off to stud in a couple of weeks (see my blog earlier in August about this match). Kym’s trotting mares – Sun Isa is booked to Pegasus Spur and her half sister Toggle is booked to Majestic Son, and they will also be off to stud shortly. And Sophie’s Choice is booked to Tintin In America. She’s the mare I’ve leased from Lynda Mellsop who is currently having such a great run as owner of Carpenters Daughter in Australia. Other news – It appears Destination Moon’s injury is not the hairline fracture it was first thought to be and he could be back racing sooner than expected. He’s the full brother to The Blue Lotus (Grinfromeartoear-Zenterfold) and showed a heap of promise in his first few races as a 2yo for owner Kerry Hoggard and trainer Steven Reid. And final bit of news: I have bought a half share in a Tintin In America yearling from a half sister to Bit Of A Legend. More about that next time. In the old days, when racing was dominated by wealthy owner-breeders, the breeding goal was to produce the best racehorse possible. The breeding goal of most Thoroughbred producers now is an animal who will generate a high price at the yearling sales. I think standardbreds have always been the “poor cousins” or “blue collar” version of racing, so I don’t think the same trend really applies so much, or at least not for the same reasons, as I’ll explain. Our early days were more about local farmers competing over hedges on farm hacks or driving carriage races down country roads! In New Zealand, owners and breeders of horses generally have often been farmers who were not necessarily wealthy in monetary terms but owned the land necessary to breed from a number of mares and raise good stock. They were “hands on” people, much as in the rural parts of North America where harness racing developed. And like North America, New Zealand and Australia were moving away from the wealth-driven class tiers of British society and into nations were ordinary folks could “have a go”. The emphasis was less on developing the best racehorse possible, and more on breeding a decent horse that could beat the neighbour’s or win at the local track or aspire to the top races. Their motivation was less about improving the breed and more about enjoying their hobby and any rewards (including kudos) that came from it. It sometimes became a passion, but not a symbol of class or wealth. The roots of harness racing in New Zealand are in stock rearing and stock management, which we have always done well, being blessed with great grass growing land and a temperate climate. So having a few trotting or pacing mares alongside the cattle or sheep was hardly an issue. That natural advantage, combined with the efforts of visionaries and importers like JR McKenzie (a businessman, not a farmer) and later his son Roy of Roydon Lodge, meant we kept our breeding in touch with modern trends, but not dominated by them. And it often required the injection of capital from local businessmen (rather than farmers) to add a more commercial slant to our racing game. Time has increased the value of farmland and changed the nature of farm ownership. 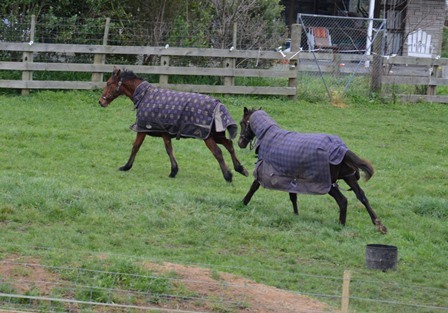 Nowadays, as research presented by John Mooney at the NZSBA conference this year surmised, this has impacted on the ability of people to afford to breed horses. Farming is more commercially focused and the generation that dabbled in horses as a passionate sideline to farming is literally dying out. The price of quality farmland is unaffordable to younger people – and if they do get some, their priority is to use it as productively as possible. The issue is the same for people who want to get into training – the demise of the “ovals” on every second farm in the Waikato and the need to open up more shared training venues as they have done in Australia. Even for small-time breeders like myself, the ability to buy enough land to carry a few mares is mostly beyond our reach. The cost of breeding cannot be absorbed as a farm cost like the old days, and becomes a separate expense using leased land or agisting mares as stud farms. And of course that immediately sets up a barrier for many – especially when the returns on a high risk investment are so vulnerable. So getting back to the quote at the start of this blog, the option to breed to get a good return at yearling sales is not motivated by greed, but rather by necessity. If I am paying out for grazing land and carrying high risks and high costs, I will be motivated to make breeding choices that give me a higher (or quicker) return. Actually, personally, I am not motivated by that but it does come into my breeding equation i.e. breeding something good will build the reputation of my mare and therefore ensure my future returns are as good as I can make them. I have gone to less fashionable but ideally suited sires to ensure this, but I see that as an investment. I simply cannot afford to be a “hobby breeder” that doesn’t consider the financial implications, not so much short-term but definitely longer term. In recent years when yearling sales returns have struggled to give adequate returns for many breeders (once you take costs into account many just break even or get a very low return for the risk they take), all that remains is the passion for breeding and – ironically – an incentive for the “poor” rather than the “wealthy” to breed an exceptional horse to lift you out of the rut. Is that a good thing for breeding? Probably not, but very much an incentive for those who have hung in there! The commercial signals are very much orange traffic lights, and a short-term commercial approach to breeding is fully understandable, if potentially limiting for the overall future of the breed. In a future blog I’ll look at how personal and “industry” breeding goals don’t necessarily line up – unless you have good leadership and clear signals. If that happens, we can get out of this bind, and into a period of growth for individuals and the overall industry. Do we have the courage to do it? 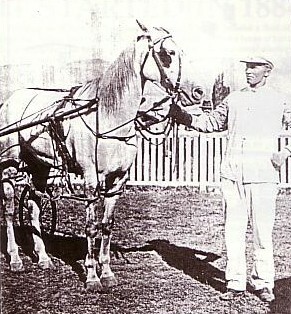 In 1919 Leo Berkett swapped a pacer he used in his gig with a clergyman for an aged grey mare, Wairoa Belle, which had good pacing blood in her on the side of her sire, Dictator. On local roads he found Wairoa Belle showed well against the horses of other gig owners and had a fair turn of speed. Leo decided to enter her in races at the Nelson Trotting Club’s summer meeting. The 1920 programme included both saddle and driven races. 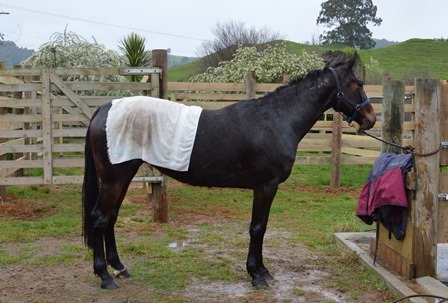 On the first day Wairoa Belle did not run well, but, on March 20, with advice on adjusting her hoppples, Leo Berkett rode her to lead the 14 horse field all the way to win by two lengths. She paid the biggest dividend in NZ trotting history of £1033/5/-… a staggering sum when the average weekly wage was less than £10. Leo Berkett had no money on the race, the one and a half Wakefield Handicap, but one person had. He was a Nelson grain and seed merchant, Mr S C (Chummy) Levien, who was so pleased by the win that he gave Berkett the odd £33. The stake of 55 sovereigns also went to Berkett as owner. The time for the race was 3min 59sec. Is selective breeding the answer? In this blog I want to share some thought-provoking ideas about selective breeding to improve the quality of racehorses and the genetic stock of mares. It comes from the thoroughbred side of life – but don’t let that put you off. I don’t agree with some of it, and will say why. What’s more important is keeping open minds and encouraging discussion. That’s often not a strength of our industry, but it is what my blog tries to do. So read on, and have a think about it. And please respond if you want. NZSBA chair John Mooney sent me an extract from a book he’s been reading called Thoroughbred Breeding – pedigree theories and the science of genetics, by Dr Matthew Binns and Tony Morris. One chapter looks at how selection of breeding males is intense and only a small, select few go on to be successful sires – but they have a significant impact on the breed through the production of large numbers of offspring and the establishment of breeding lines. The improvement of females through selection is much weaker, with lower grade mares lacking performance and soundness having often been allowed to breed to meet the market for numbers of racehorses, at least until the recession bit from 2008. The lack of selection on the distaff side in Thoroughbred breeding inevitably presents a major barrier to genetic improvement, and although the recession…will doubtless lead to many inferior females being withdrawn from the production line, their removal will make little difference; a technique which could bring advances has been developed and is available, but it has not been sanctioned by the Stud Book authorities who control the breeding of Thoroughbreds. Embryo transfer…is a procedure which would enable better-quality mares to produce several offspring per year instead of the one decreed by Nature. In this way the number of foals born might be retained while improving the overall quality of the breed, but current regulations do not even allow foals to be conceived by artificial insemination, so the introduction of embryo transfer is something for the distant future, if ever. Readers of my blog will know that I advocate for full consideration of a system for standardbred breeding that allows 2 foals in a season from the same mare, one carried by that mare and the other by embryo transfer to a surrogate mare. So it is interesting to see this issue being raised in a different context – for improved breeding of thoroughbreds. Having said that, I’m very aware how different the thoroughbred situation is from ours – we have already introduced artificial insemination and allow some embryo transfers. However I don’t agree that genetic selection to improve the breed is what should drive the decision to allow more than one foal per mare. I’m more interested in it as a way of keeping breeding numbers up, increasing diversity and providing commercially focused breeders with better opportunities to get a return on their risky investment. There is, in my view, a need to maintain a level of genetic diversity (however limited it is within our very inbred industry) rather than a simplistic “breed the best to the best” approach. That is one reason I have suggested two foals per season as reasonable (and from different sires, so that breeders are encouraged to be more adventurous in their selection of sires for more commercial mares). In the old days, when racing was dominated by wealthy owner-breeders, the breeding goal was to produce the best racehorse possible. The breeding goal of most Thoroughbred producers now is an animal who will generate a high price at the yearling sales. This leads to mating plans based on fashion, and, in defiance of logic, the most fashionable stallions are often the newest recruits to the ranks. Although everyone is aware that the vast majority of stallions are destined to be relatively unsuccessful at stud, breeders routinely place their trust in unproven horses to the extent that some 40 per cent of most foal crops have sires whose progeny have not been tested on the racecourse. Given the large books of mares covered by many of these unproven stallions, some may have 500 foals before it becomes clear that they are failures. Many of the females produced find their way into the breeding population to disseminate unfavourable genetic combinations. While the production of commercial yearlings takes precedence over the goal of producing successful racehorses, the breeding industry will not develop Thoroughbreds of greater genetic strength. 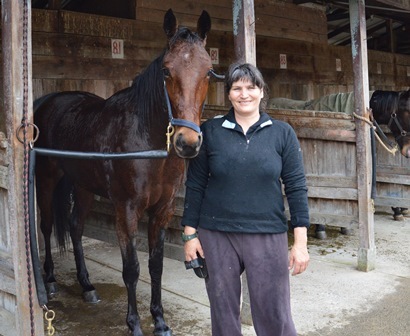 Do New Zealand standardbred breeders look for fashionable new sires? In some cases, but overall it’s not a driving factor in breeding decisions in New Zealand. Yes, many of the trainer-buyers at our standardbred yearling sales are looking for fashionably bred yearlings to ‘sell on’ to owners because those owners will view more positively having Somebeachsomewhere to brag about, even though the best yearling on type was a Live Or Die or a Grinfromeartoear. In the standardbred world, the North American hype around first season sires is driven not so much by breeders looking for ‘fashionable’ sires, but more by the owners of the recently retired racehorse and the stud who has a vested interest in him. They are desperately needing their horse to become “fashionable”. In reality, very few horses carry such an aura off the track that they capture global enthusiasm. Somebeachsomewhere and Rock N Roll Heaven would be recent examples, and of course SBSW has now moved into a “proven” category in North American (which may or may not be reflected in success in the southern hemisphere). But many other top racehorses who become first season sires are not likely to be viewed so confidently. They will struggle to get a toe-hold in a market that is over-supplied with new sires. So our situation is quite different from that outlined by Binns and Morris in the quote above. Binns and Morris also say that favouring new, unproven sires is working against the long-term genetic improvement of a breed. I’m not at all worried about breeders experimenting with new season sires – in fact I encourage it. How are stallions expected to show what they can produce if they don’t get a decent number and range of mares? If selective breeding means concentrating on proven mares crossed with proven sires, I can feel a big yawn coming on. Playing safe is wise but not necessarily how nature has made significant advances! We might end up with an improved genetic product, but we may miss important contributions coming from left field. After all “successful sires” and “successful mares” are only those we identify in hindsight. History shows us many examples of sires that were not valued/fashionable or not overwhelmingly successful as a sire, but later added an important injection of genes into our breed. Well, locally look at our beloved sire Vance Hanover, who was unraced and unproven, an imported son of Albatross from a good family, who attracted his first big books of “nondescript” mares here through an extremely affordable service fee, and went on to set siring records for many years. It’s stimulating to think about these things. In my next blog I will look at a good point Binns and Morris raise: What is our breeding goal? The New Zealand Standardbred Breeders Association deserve a loud round of applause, followed by a clinking of glasses, after the announcement of the new breeders bonus scheme for the Metropolitan Trotting Club. The scheme which starts on 1st January 2014, is open to any member of the NZSBA who breeds the winner of a totalisator race at an NZMTC meeting, held at Addington Raceway. They will be eligible for a $500 bonus payment. So the parameters are clearly stated, and they spread the bonus concept beyond a few elite races or series which require breeders to make eligibility payments. This is more for the breeders of “ordinary but good” horses who win at the week to week race meetings but may not succeed at the Breeders Crown or Sales Series Final. Hats off and thrown in the air for the NZMTC for coming to the party on the breeders bonus concept. This, combined with its recent announcement of stakes increases, puts the club up there with Auckland in terms of leadership when the industry most needs it. I would dearly love to see a similar scheme in Auckland, or even locally here in Cambridge. While many breeders aim to sell what they breed, there is a greater number who end up owning and racing what they breed. These sorts of bonuses are ideal for those who breed/own/race and will now have an added incentive to get a horse to the Met. For those like me who breed to sell, it is lovely to get some reward later if a horse goes on to race well and win. 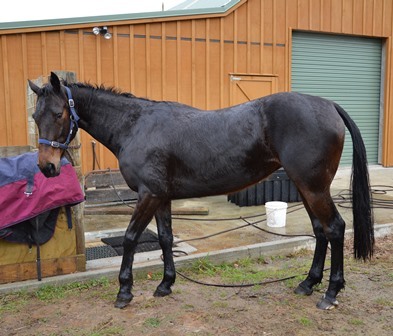 $500 can cover a few bills and a bag or two of carrots for the mare! I hope the scheme will also result in more people joining the NZSBA – it’s our voice as breeders and deserves our support. I have a response from Dot Schmidt in Australia which may answer the question posed in a previous blog – and initially by Harvey Kaplan – about the Bettor’s Delight over Falcon Seelster mare cross being so much more potent in America than it has been in Australia or New Zealand. I listed some possible reasons, and flagged up that this is not unique to the Bettor’s Delight/FS cross. I think you’ll find the disparity here and for all sires that have stood in the US/Canada and downunder is that we register all the foals they produce whereas up there they don’t. The yearling catalogues from the non APG sales here in Oz (Australia) have North American and Australian sire winner percentages in the stallion bios at the back and NA percentages for winners are always around 10% better, sometimes more,once a stallion has a reasonable number of foals in both hemispheres. Of course there is some variation as a result of the different genetics of the mare populations but most of it is the different registration process. I don’t think the Americans have to register the foals until they want to sell or race them. The BD/FS cross up there does seem very impressive still all the same. Thanks for that, Dot. Any other comments (on this page using the respond feature, or to me at bee.raglan@xtra.co.nz are welcomed. Manicure, shower and massage for two of our mares yesterday as we moved them from one of our “virtual farm” paddocks to another. 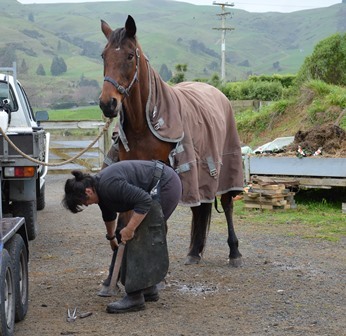 Who is this rather handsome looking mare getting a hoof trim and wash by owner Kym Kearns? It’s 26 year-old Isa Countessa (Krissy) the much loved dam of Sun Isa and so grandam of Flying Isa (the colt who won the Australasian 2yo Trotters Breeders Crown in 2011). The bottom two photos are of my mare The Blue Lotus, whose pedigree was shown in the last blog. Her first foal took a lot out of her, and it has been a work-in-progress to get her condition and confidence back up. She’s feeling a lot better now that she’s got her figure back! The Blue Lotus aka Lottie wants a bit more attention please! Looking after your mares is such an important part of breeding. You cannot expect them to deliver unless you put the time, effort and nutrients into them – or make sure good people are doing so on your behalf. Our mares have been very good to us, and in return we are good to them. In my last blog I looked at the pedigrees of some of Shadow Play’s first racing age crop winners in North America, and found that he appears to enjoy mares carrying plenty of the same good genetic influences that he has himself. Now I’ll take a quick look at what mares he received in his seasons so far in New Zealand and specifically the cross with my mare The Blue Lotus who is Grinfromeartoear-Zenterfold, and therefore a half sister to the very good pacer and now sire Tintin In America. Any analysis/comments for the Australian mares would be interesting – send to me, or add as a comment. Richard, my Australian colleague, has also done analysis of the maternal families that Shadow Play’s North American winners have come from so far. That’s not an area I know much about at all so I will bring you more of his comments in another blog. Shadow Play has had two crops in New Zealand to date so they have (as at 1 August) just become 2yos and yearlings. On HRNZ database it records 27 live foals (19 in the first year and 8 in the next) although I can count only 25 foals listed as progeny. Pedigree-wise, Shadow Play would be playing in quite a different pool of broodmares than in North America. Artsplace mares are scarce as hens teeth here, so the Artsplace connection would come through his sons, not his daughters, unlike the rich tap of Artsplace mares he has accessed in North America. New Zealand also does not have so much No Nukes influence in our maternal lines. Probably one of the most successful sires in New Zealand who have No Nukes as a damsire is Washington VC, a son of Presidential Ball who flies under the radar for many of us because he is basically only available to lower South Island/Southland mares – he is the sire of very good horses like Imthemightquinn, Foreal and Georgetown. We’ve had Riverboat King with a No Nukes damsire and there are a decent number of Riverboat King mares around, but none so far as a match for Shadow Play. Live Or Die is from the No Nukes/Oil Burner sire line and carries Breath O Spring as well, but as yet no Live Or Die mares have been matched with Shadow Play here. Tinted Cloud, the In The Pocket son, has No Nukes as his damsire and Race Time-Breath O Spring on his maternal line, and there is one match so far between a Tinted Cloud mare and Shadow Play – and of course that will have the Direct Scooter double up as well. For many others the No Nukes connection will be as the sire of Western Hanover, which brings in a probably too close a cross for most breeders with Shadow Play being a son of Western Hanover sire The Panderosa. (I think in Australia there will be many more mares with Artsplace as their sire and with No Nukes in their pedigree). However New Zealand mares do have a lot of other things to offer Shadow Play that he seems to enjoy – plenty of Adios, plenty of Tar Heel (who of course crossed so well with Adios himself and traces to Rose Scott, the full sister to Scotland). Plenty of other links to Old Maid/Spinster/Scotland blood. A couple of our early sires U. Scott (a son of Scotland) and Light Brigade (a son of Spinster) tap into this fantastic old blood, and yet another very good sire and damsire here Bachelor Hanover in the 1970s was a son of The Old Maid. Shadow Play’s damsire is Matt’s Scooter, and Matt’s Scooter is about the only Direct Scooter influence you find now in North America. New Zealand mares can also offer Direct Scooter througha different stunningly successful branch – In The Pocket, his mares and his successful sire sons, and also through some other sons of Direct Scooter who stood here (mainly OK Bye and to a much lesser extent Deal Direct and Tinted Cloud). In The Pocket brings both Direct Scooter and Tar Heel into the picture up close. Our other hugely influential sires of recent times – Holmes Hanover and Falcon Seelster – also have pedigrees that have are interesting with Shadow Play. Holmes Hanover bring Tar Heel , Adios and The Old Maid, and Falcon Seelster brings Warm Breeze (Shadow Play’s grandamsire) and therefore Good Time and Breath O Spring/Scotland/Spinster, and also a couple of doses of Adios. Shadow Play is not the only sire that has or will relish the way New Zealand mares can deliver these influences! That is one reason why our breeding stock have been well regarded – their genetic structure is often deep with quality. A quick look at the mares Shadow Play has had here to date indicate that Shadow Wave is also present, in spite of a lack of No Nukes. Mares by Elsu, New York Motoring, Artiscape and Pacific Rocket are all bringing Shadow Wave in via the dam (Peaches N Cream) of New York Motoring or his full brother Happy Motoring, and in future we have an increasing number of commercial mares who have the Shadow Wave-Golden Miss combo in their maternal lines. None of this will necessarily give the mares a “golden cross” with Shadow Play, but it is food for thought for breeders. As always, type, temperament and Shadow Play’s own ability to be a successful sire must be there as well. The jury will still be out on that for another year or so. It is interesting that he got so few mares here to date, and that the link to our mares (particularly Direct Scooter and Warm Breeze connections to In The Pocket and Falcon Seelster) were not picked up on so much in the marketing or by breeders so far. His first crop success in North America will probably deliver him a much better book this season. OK now to my own mare. 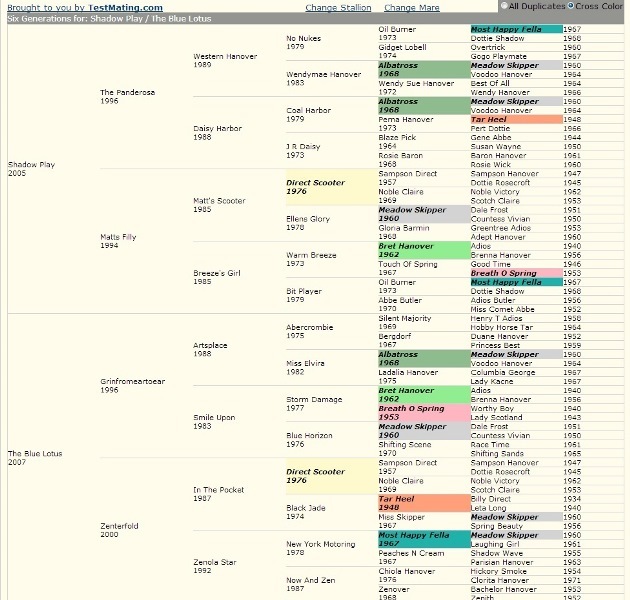 You can use Tesio or whatever system you have to look more closely at this if you want, but here is a snapshot. The Blue Lotus is a Grinfromeartoear daughter of Zenterfold (In The Pocket), and a full sister to the promising Destination Moon. So she carries heaps of the blood we have seen in Shadow Play’s most successful foals. The resulting foal would also be 4×4 to Direct Scooter – that’s the closest cross. Direct Scooter is 4 x 4 and reinforced, which is great. She has some great old Spinster type influences fairly prominent on her strong heart lines that will connect to Shadow Play, quite nicely. Shadow Wave is further reinforced with a couple more doses. The mating also brings Albatross into play quite strongly and is reversed 5 x 5 , I think this is a very important connection. Sampson Direct’s kid sister, Dottie Hal also comes into the mix to reverse the Sampson Hanover affect. I really think that Lottie’s speed influences are coming from the Direct Scooter/Spinster aspect of her pedigree and a mating with Shadow Play could see another dose of extreme speed injected into the foal from a totally different and new influence, NO NUKES. For me, genetically this feels a very balanced match which reinforces quality genes rather than outcrossing to completely new blood. I like the presence of siblings Touch Of Spring, Race Time and Storm Damage all bringing Breath O Spring into the equation. And Zenterfold brings in The Old Maid via Bachelor Hanover. There are 4 duplications of Shadow Wave in the background, two via Oil Burner in Shadow Play’s pedigree, and 2 via other lines (Shifting Sands and Peaches N Cream) in The Blue Lotus’s pedigree. The Blue Lotus is a good sized mare and was a tough, gutsy type of race horse. She has been heart-scored and is well above average in that department. Although she took a 1.56.6 record, I am looking for speed and athleticism to add to her, and that is also what Shadow Play may offer. Her first foal is by Bettor’s Delight for The Blue Lotus Syndicate and will be entered into the 2014 yearling sale at Karaka in the Breckon Farms draft.